This is the third article in Color Theory: a complete set of lessons for Art students. It is estimated that 40% of those who are color blind remain undiagnosed by the time they leave high school. Could you be color blind? What does this even mean? Are you entering a career where color choices are important? What are the implications for an artist or designer who is color blind – or for someone who is studying Art at school or college? How can designers ensure that their work is accessible for those with a vision deficiency? What modifications should be made when teaching a color blind student? Answers to these questions and more are discussed below. This color arrangement test (by Daniel Flück of Colblindor) is a version of the D-15 Farnsworth color test, which asks you arrange colors in a smooth gradation of hues. You may wish to take this test and then return to the rest of this article. I failed this test. Am I color blind? Firstly, please note that your monitor or digital screen may affect or invalidate results, as colors may not be represented exactly as intended. If the test indicates that you have some form of color deficiency, you should seek out a full color vision diagnostic test from a doctor to verify the results. This color blind test does not always identify those with mild color blindness. Please read on to find general information about color blindess and what it may mean for an artist or designer. What does color blind mean? 1. the inability to distinguish one or several chromatic colors, independent of the capacity for distinguishing light and shade. 2. complete inability to distinguish colors of the spectrum, with all objects appearing as shades of gray, black, and white, varying only as to lightness and darkness. This means that color blindness is the inability to see certain colors or to distinguish them from other colors. In rare cases, individuals may be unable to see any color at all and may view the world in black, white and grey. What causes a deficiency in color vision? In people with normal vision, three types of cone cells exist in the eye, each sensitive to a different set of light wavelengths within the visible light spectrum: long, medium and short wavelengths. Although referred to as the ‘blue’, ‘green’ and ‘red’ cones, each receptor is sensitive to a range of wavelengths, and these are stimulated to a different degree, depending on the color of light that is received. The different combinations result in the perception of about a million distinguishable hues. When all of these three cone types are present, a person is able to perceive a continuous range of color, called trichromatic vision. 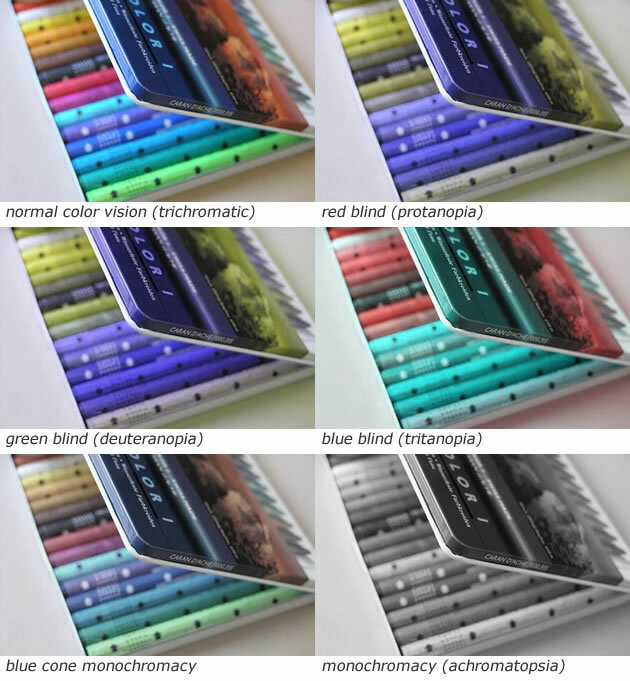 Color blindness occurs where an unusual combination of retinal cone cells are inherited, or where genetic mutation causes one or more of the cone types to be less sensitive than usual. For example, two red or two green cones might be inherited along with blue (rather than red, green and blue cones that are normal). These variations may cause a mild or severe color vision deficiency. A rarer type of color blindness is caused when a disease, infection or accident damages the eye, optic nerve or brain, resulting in a sudden or gradual onset of vision change. This type of color blindness is usually identified quickly, as the sufferer notices the change. A subset of women has been recently discovered to have four types of cones (some hypothesise that these women might usually be the mothers of color blind sons), giving them tetrachromatic vision – the ability to perceive an additional set of wavelengths that normal-vision people are unable to see. The additional cone usually picks up colors in the orange range (or sometimes other types of green) and may allow tetrachromatics to experience 100 million separate hues (99 million more than normal). This ‘super vision’ is only possible for women, as the genes for pigment in green and red cones lie on the X chromosome. This super vision is estimated to occur in between 2-3% of women, but, as with color blindness, is often undiagnosed, as this always been ‘normal’ for them – having existed since birth. How common is male color blindness? About 8 percent of the world’s men with Northern European ancestry are estimated to have color deficiency (1 in 12 men). It is common for high school classrooms to have at least one color blind student in the room, although this person may not always realise, or may hide this information from others. Women are far less likely to be color blind – an estimated 0.4% of the female population. For a girl to be color blind girl, both her mother and father must carry the gene. Most color blind tests ask you to identify an image, based on the Ishihara color test. Test images are formed from dots of different colors that contain hidden pictures, letters or numbers. Some of the differences in hue are not discernible to those with certain types of vision deficiency. An inexpensive color blindness test that can be distributed to large groups and taken in less than five minutes is available from professors Jay Neitz and Maureen Neitz from the Department of Ophthalmology, University of Washington. This test allows teachers to quietly and unobtrusively test all students for color blindness in less than 5 minutes. Can color blindess be treated? Color blind treatment does not yet exist, however professors Jay Neitz and Maureen Neitz are running exciting clinical trials in which gene therapy has been used to successfuly instate color vision in male monkeys that have been color blind since birth. They are still analysing long term side effects and whether the treatment might one day be safe for humans. The glasses help Adam to see warmer, redder hues, however sometimes made it difficult for him to separate between these warmer hues (for example, the difference between red and orange became more difficult to see) and also between cooler colors (greens, grays, blues). 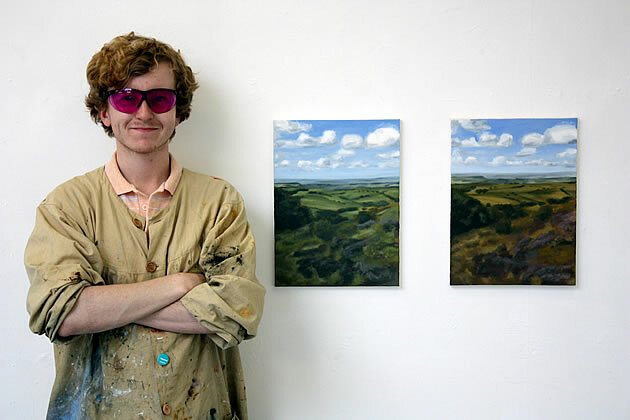 Artist Adam Fenton wearing Oxy-Iso color blind glasses. The work on the left was made without the glasses; the work on the right was made with them. 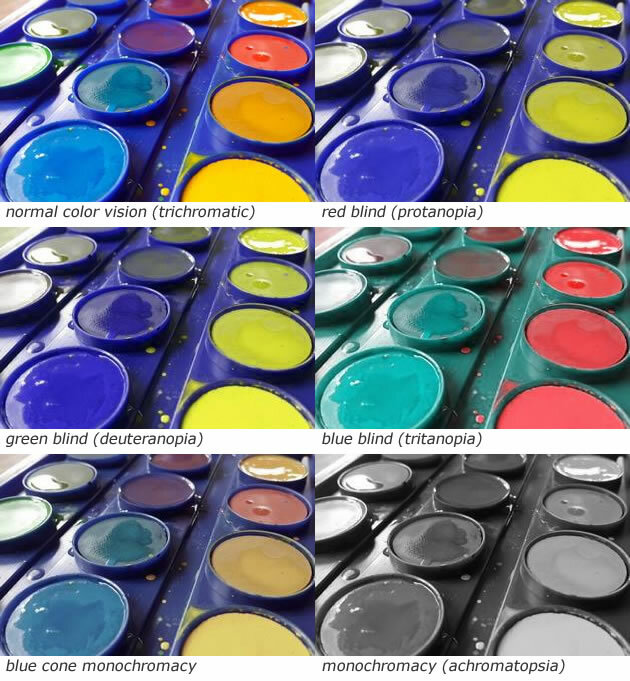 What is it like to be color blind? How do color blind people see the world? This depends upon the type of color blindness and the severity. According to the US National Library of Medicine, red-green color blindness is the most common type, followed by blue-yellow color blindness (1/10,000 people) and lastly blue cone monochromacy (1/100,000). It should be noted that these are broad titles that don’t indicate clearly which colors are seen. Some people with a mild red-green color deficiency are able to differentiate between many shades of red and green, for example. For more severe color blindness, however, whole groups of colors may look like darker and lighter versions of the same color (i.e. red, orange and yellow may look like different tones of one hue). According to colorvisiontesting.com the colors most often confused are pink/gray, orange/red, white/green, green/brown, blue green/gray, green/yellow, brown/maroon, and beige/green. Interestingly, Facebook is blue because Mark Zuckerberg is color blind – tweet this! I usually explain my color blindness like this: “I don’t see red or green as well as most people. So if I’m looking at a purple that’s very blue, I might think it’s blue, since I don’t pick up the red in it.” Turns out that’s the tip of the iceberg when it comes to oil painting. My teacher says I tend to make everything too cold, that is, not red enough. In a way, that makes sense–I don’t see the red in the model’s skin, say, so I don’t mix it into my paint on my pallet. We have put together some illustrations below using digital color blind simulators to help illustrate what a color blind person sees. Digital simulators are are great tools for designers, as they allow you to test a design and make sure it is easy to navigate and read for those whose color vision is impaired. You might have heard the theory that Vincent van Gogh was color blind – a question that was raised when a Japanese medical student Kazunori Asada noticed that the color palettes used in van Gogh’s paintings appeared ‘smoother’ and more realistic when viewed through certain color blind simulators (others are convinced that his competent handling of green makes this unlikely). Whether or not this is true or not, viewing artworks as others might see them is fascinating! Was van Gogh color blind? 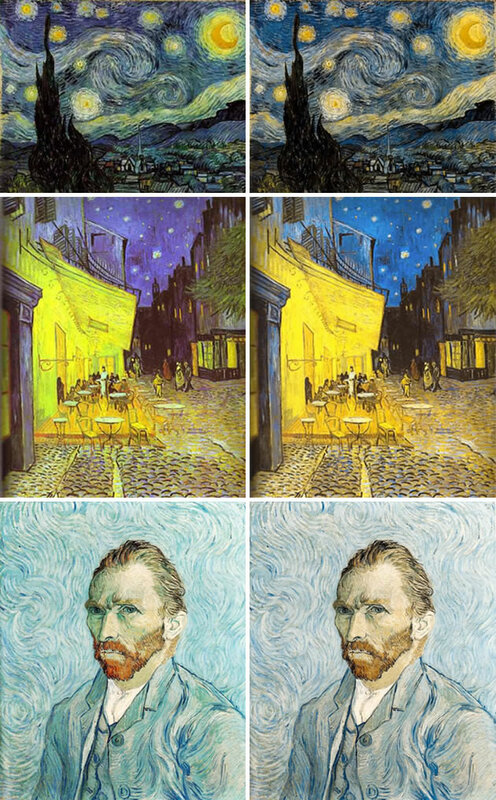 ‘The Starry Night’ (top), ‘The Café Terrace on the Place du Forum Arles at Night’ (middle) and ‘Self-Portrait’ (bottom) are shown in their original color on the left and with a mild color blind simulation applied on the right. Severe color blindness can bring much frustration – mixing up crayons, missing color coded information, not recognising when fruit is ripe, not seeing the difference between red and green traffic lights and so on. It is important for teachers to make lessons that minimise frustrations for those with diagnosed and undiagnosed color deficiencies. Many great points are outlined in the Teachers Advice Booklet for Secondary School prepared by www.colourblindawareness.org. We have summarised those that are relevant for Art students below, along with additional recommendations. Please read their full document for more information and advice about other high school subjects. 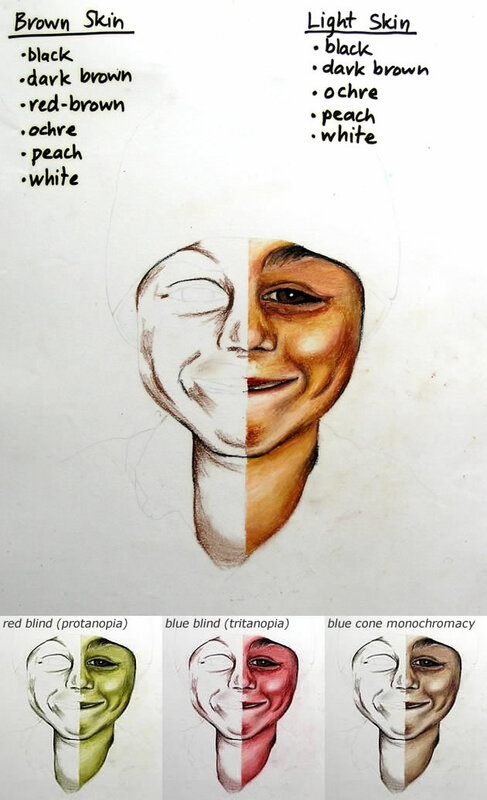 This teaching resource for Year 9 Art students lists the colors in order used to create skin tone (identical names to those on the brand of pastel used) to help eliminate confusion for color blind students. At the bottom we have included simulations of various color blindness at the bottom, indicating how challenging skin tones can be for those with color deficiency! Be aware that many books, illustrations and graphic designs are not designed for a color blind audience and often contain portions that are inaccessible for those with a color vision deficiency. Photocopy sheets into black and white to check that all information is legible. When creating your own resources, use the design guidelines below. Note: these recommendations often result in an improvement in clarity for those with normal color vision as well! Remember that materials, viewing format and lighting conditions affect how colors are recognized. I am color blind. Can I still be an artist or designer? At age 32, artist Peter Milton, who had studied at Yale under Josef Albers, author of Interaction of Color, and was teaching Art at the Maryland Institute College of Art in Baltimore, received feedback that would forever alter the direction of his work. …someone referred to how warm and sort of pinky the landscapes were,” he says, “and I was horrified.” – NPR. A short test quickly diagnosed Peter with red-green color blindness. He now works primarily in black and white, producing beautiful intricate prints. Although a career in some areas of the visual arts may be challenging (if required to carry out precise color matching or mixing colours of paint, for example), the examples included within this article indicate that being a color blind artist is entirely possible. If you have a confirmed color deficiency, rather than concentrating on your inability to see or mix every color, focus on the advantages of being color blind (yes, there are positives to be found in every situation). Some color blind people are better at detecting certain camouflages – and are able to perceive certain color combinations better than normal sighted people. Certain types of color deficiencies lead to improved night vision and an ability to identify variations in luminosity with more accuracy (for example, a ‘reverse color blind test’ has been created that many color blind people can read, but normal visioned people cannot). Given the high proportions of red-green color blindness, it is even suggested there may be an evolutionary advantage (perhaps men with this type of color blindness were better at spotting prey – or an enemy – hiding in a forest)! Remember, too, that even those with ‘normal’ vision disagree about color choice. The more we limit ourselves, the more resourceful we become. – tweet this! But there is an alternative. You can use your constraints to drive creativity. I can’t tell you enough of my shock when I found out I am color blind. I wanted to be an artist since I was a child and the earth seemed shattered when I learned about that. But, look at it from the bright side, if you didn’t know about your color vision problem until you took a test, that means your problem isn’t too severe. That also means color theory is your best friend. I try to teach students that low vision or color “blindness” are not necessarily faulty vision… they are “different” vision. And may in some ways be better, or at least just as valid, depending on what you are trying to do. You have more of an “impressionist” view of a distant landscape than others with perfect vision — it’s not better or worse, but alternative. I am convinced that these differences in vision are of no importance. One sees as one wishes to see. It’s false, and it is that falsity that constitutes art. So what does it mean to be color blind in an artistic career? It means you have an additional design constraint – one that may, in fact, form a great point of difference and trigger creative output. Perhaps you can make art about color blindness itself and throw yourself full throttle into an investigation of color, as you see it. Perhaps you can continue as you have done, but seek outside input for color choices (such as the opinion of others or using digital color matching tools) or intellectualize some aspects of color theory. Perhaps you deliberately move away from realism and apply unusual, unexpected color schemes with purpose, or limit your color palette to those you see well. Perhaps you embrace your own different view of color and celebrate it. Perhaps you focus on the many other wonderful and critical aspects of an artwork – line, texture, shape, space, tone, 3D form, surface or material (in case it isn’t obvious, a color blind artist can still be an exceptional observational drawer; a phenomenal sculptor; generate inventive compositions and communicate ideas visually in superb, original ways). In his excellent book Art & Ophthalmology: The Impact of Eye Diseases on Painters Phillippe Lanthony makes the observation that while color blind painters may use a limited color palette, their work is ‘not at all discernible from those paintings that are made by a painter with normal color vision’ and that color blind painters are thus difficult to detect throughout history. To give you further example of what is possible, we have collated a list of some more famous color blind people who have achieved success in the art and design field. Color blind artist Neil Harbisson has achromatopsia, which means he sees no color at all. He wears a custom made high-tech headset that measures color frequency and transmits this into a sound that is transmitted directly into his skull via a headband. Rather than seeing color, he hears it. Harbisson got into art school, after teachers made an exception, letting him paint only in the gray scale. He went on to study color theory. Charles Méryon gradually gave up painting to become a black and white printmaker after he was diagnosed with red–green color blindness. He is one of the most significant etchers of 19th Century France. Color blind painter Clifton Ernest Pugh was awarded the Australia’s Archibald Prize three times and recognized for his contribution to Australian art. Irish painter Paul Henry concealed his color blindness and it was only revealed by his doctor after his death. In the later part of his career, he chose to paint predominantly in blues and yellows. Australian color blind artist James Charles Nuttall studied at the National Gallery School of Design and then worked as an illustrator. Copies of his most famous work, a monochromatic sepia painting titled ‘The First Federal Parliament of Australia, May 1901’ were hung in homes and schools throughout Australia. Artist Robert McCall who produces spaceflight-themed work, discovered that he was color blind when he was 20. 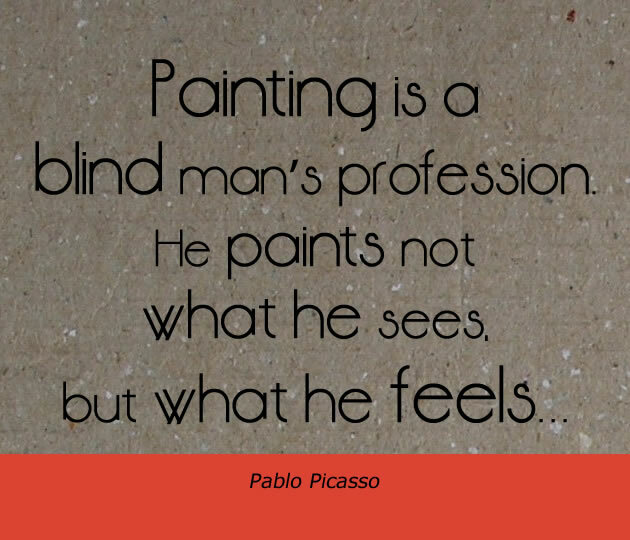 He had been making a living as an artist for the previous three years and the possibility that he was color blind had never occurred to him. Albert Uderzo, one of the creators of the world renowned Astérix comic book series is color blind and carefully labelled his pens as a boy. Comic book artist Tim Sale provides the artwork for the TV shoe heroes. He is color blind and creates works in black and white that are digitally colored by others. Another comic book creator John Lindley Byrne is unable to see some greens and browns. He has worked on Marvel Comics, X-Men and Fantastic Four. When colored pencil artist Bonnie Auten found out she was color blind, she learned everything she could about color theory, the color wheel and color blindness.